Team CanSIA frequently represent the solar energy industry at conferences and events across Canada. A selection of highlights and resources from past public appearances are presented here for your reference. ​July 6 - On March 31, 2017, the Alberta Utilities Commission initiated Proceeding 22534, in response to Order in Council 120/2017 directing the Commission to inquire into and report to the Alberta Minister of Energy, on matters relating to electric distribution system-connected generation (DCG), in accordance with the terms of reference provided in the Schedule to the order-in-council. 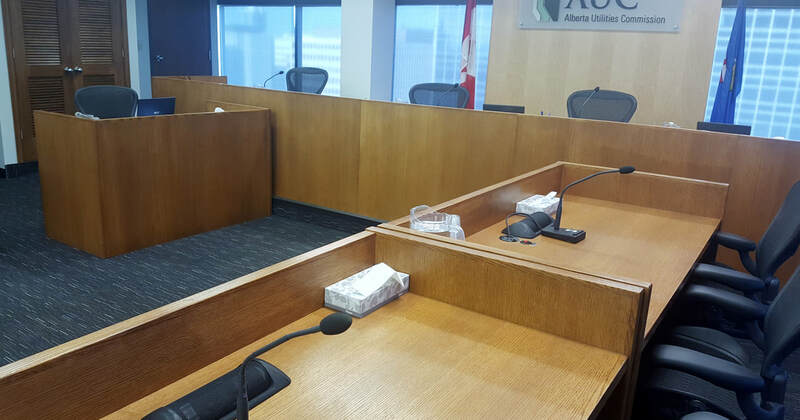 In July 2017, Patrick Bateman CanSIA’s Director of Policy & Market Development represented CanSIA before the Commission in an oral proceeding to discuss the status and outlook of solar electricity, community solar, retail and rate design and the roles of wires and wires-owners. The audio is available from the AUC’s public hearing webcast archive. May 9-11 - “Another sold-out event renewable energy industry conference in Alberta demonstrates the investment and job creation that this sector represents for the province,” said John Gorman, President and CEO, Canadian Solar Industries Association. “The conference was abuzz with individuals from all corners of Western Canada and from across the economy working to make solar energy meaningful in their communities and to their bottom lines. Solar companies are discussing opportunities with oil and gas companies. Municipalities, schools and indigenous communities are exploring how they can partner with industry or lead on projects. It is a very exciting time watching solar energy moving from niche to mainstream”. Click here to read the full post show press release. ​December 5-7 - CanSIA's Annual Solar Canada Conference & Exposition 2016 provided another excellent year to connect with industry professionals and enter the growing solar markets across Canada.Solar Canada is the perfect opportunity to learn and network with thousands of attendees and hundreds of exhibitors representing the entire industry: solar integration, development, engineering and EPC, equipment manufacturers, utilities, consultants, federal, provincial and municipal governments, communities, and students. Click here to view this year's program and slidedecks. At the conference, CanSIA's policy directors, Patrick Bateman and Ben Weir, shared some reflections on the year that was coming to a close and the implications they would bring for the industry in the year ahead (slidedeck or listen to the audio below). November 30 - December 1 - CanSIA's Director of Policy and Regulatory Affairs, Ben Weir, was invited to speak at Construct Canada 2016. Weir provided an insightful presentation on 'Utilizing Solar Technologies to Reduce Energy Costs'. The Buildings Show, produced by Informa Exhibitions, is home to Construct Canada, PM Expo, HomeBuilder & Renovator Expo, World of Concrete Pavilion and IIDEXCanada. It is North America’s largest exposition, networking & educational event for design, construction and real estate industries. October 5-7 – Attendees of CanSIA’s 7th annual western regional conference in Edmonton were full of anticipation for new details of how the Western Canadian solar energy markets would develop in light of Alberta’s 30% and Saskatchewan’s 50% (by capacity) by 2030 renewable energy targets. CanSIA President & CEO John Gorman delivered opening remarks before introducing Minister of Environment & Parks (and Minister responsible for the Alberta Climate Change Office) whose keynote address included an announcement that the Government of Alberta would initiate a process to explore the potential to procure 135,000 MWh of solar electricity per year to serve more than 1,500 government-owned properties and buildings. This initiative would make the Government of Alberta more than 50% solar-powered. The audio of the conference opening and keynote address can be played below the photo. October 20-21 - CanSIA President & CEO, John Gorman, was invited to speak at the Canadian Climate Forum's 2016 Symposium in a session titled 'Improving Sustainability in the Electricity Sector'. The session will focus on the increasing reliance on electricity as an energy source to lower carbon emissions, exploring a range of environmental, economic, logistical and technological factors in this transition. See further details here. September 14-15 - Alberta's Minister of Environment and Parks and Minister Responsible for the Climate Change Office Shannon Phillips, announced that the province will commit to a firm target of 30% by 2030 and support 5,000 MW of additional renewable energy capacity. During a session later in the day at the conference where the announcement was delivered, CanSIA and CanWEA representatives Patrick Bateman & Evan Wilson delivered the key message that "30% renewables by 2030 is achievable in Alberta both cost-effectively and without compromising reliability of supply". See picture of Patrick Bateman, Minister Phillips and Evan Wilson (left to right). ​August 31 - CanSIA President & CEO, John Gorman, was invited to travel to Guadalajara (State of Jalisco) Mexico, to speak at the 2nd Climate Summit of the Americas to discuss the vital role of climate action in business. Organized by the Government of Jalisco through the Ministry of Environment and Territorial Development, the summit focused on the new challenges presented in the newly implemented 2030 development agenda and the Paris Agreements; in particular the exchange of experiences in climate action, financing and regulation and resume the commitments agreed in the Declaration of Ontario 2015. The summit brought together sub-national governments across the American continent, including Premier Kathleen Wynne, joined these critical discussions. Watch this video to see John speaking about the importance of climate action. July 19 - For years Toronto residents have argued for a cleaner and greener future for the old Kodak lands and the surrounding communities. CanSIA's Director of Policy and Regulatory Affairs, Ben Weir, joined an important community meeting on green power, the community's energy needs, and the latest word on gas plant plans. See event details here. June 2-3 – CanSIA's President & CEO, John Gorman moderated a panel session entitled: “Financing Utility-Scale Solar in Alberta and Saskatchewan” to a sold-out audience of 400 electricity and finance sector executives. During his opening remarks, John stressed that Alberta is very well positioned to develop and implement a “made-in-Alberta” solution to the competitive procurement of renewable electricity and that while the Renewable Electricity Program (REP) is shaping up well for very large projects, that there also lies a unique opportunity for utility-scale solar electricity generation facilities connected at the distribution level. These projects will require a different approach from policy-makers as projects of this scale face challenges including difficulties in attracting Project Finance for single projects. Panelists discussed the cost-competitiveness of the distribution-connected facilities vis-a-vis other renewable technologies and their benefits including proximity to load, ownership structure opportunities for local communities and the deferral of infrastructure investments. 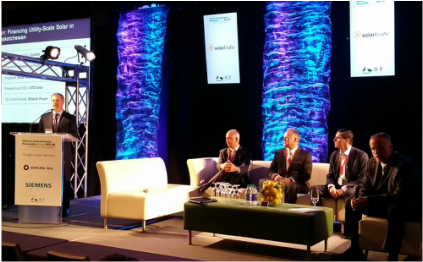 ​May 16-17 - CanSIA's President & CEO, John Gorman and Vice-President, Wes Johnston provided the conference opening at Solar Ontario 2016, CanSIA’s annual Ontario regional conference held in Niagara Falls on May 16-17, 2016. The pair noted that climate change and energy policy are continuing to converge and that a new array of extraordinary opportunities are emerging for the solar industry to navigate. The conference opening was then followed by an interactive “fire-side-chat” style session moderated by John Gorman with participation from Bruce Campbell, President & CEO, the Independent Electricity System Operator (IESO) and John Godfrey, Ontario Climate Action Group Chair and Special Advisor to the Government of Ontario that touched on topics including Ontario’s Climate Action Plan and upcoming Long Term Energy Plan consultations. February 2, 2016 - ​John Gorman, CanSIA President & CEO represented the Canadian Council on Renewable Electricity (CanCORE) at the Energy Council of Canada’s Canadian Energy Industry – Updates and Insights. This annual event focused on energy supply, storage and other sectoral issues including human resources attracted more than one hundred and eighty senior energy executives, federal elected officials, political and departmental staff and a large contingent from the diplomatic community including fifteen Ambassadors and High Commissioners. The session that John participated in was titled “Energy Supply: Electricity” and his presentation may be viewed online. Kim Rudd MP, Parliamentary Secretary to the Minister of Natural Resources, delivered opening remarks at the event which may also be viewed online. December 7, 2015 - ​Solar Canada 2015 hosted the Great Canadian Energy Conversation again where John Gorman, CanSIA President & CEO, had the opportunity to discuss energy's past and future with colleagues from other energy sector industry associations. October 7, 2015 - ​Is Alberta going to integrate a significant amount of renewables into the electricity system to meet its climate change objectives? According to John Gorman, CanSIA President & CEO the answer is yes! 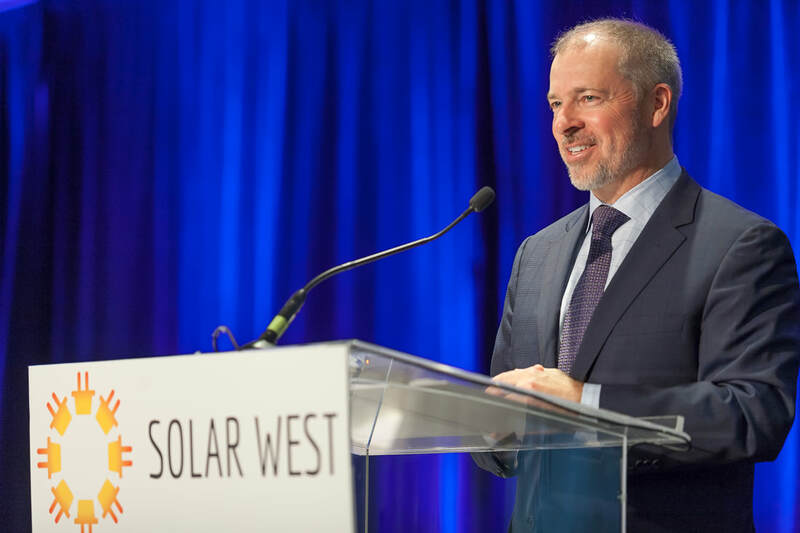 John's address to attendees of Solar West 2015 describes why that is the case and what CanSIA's position on the most suitable public policy to deliver this would be in Alberta. ​John’s remarks may be listened to online and the accompanying slides are also available. July 9, 2015 - ​Ontario hosted the Climate Summit of the Americas from July 7-9 in Toronto and welcomed more than 300 delegates from 20 states and regions who will work towards commitments to reduce greenhouse gas emissions and discuss opportunities to invest in a global low carbon economy. The Summit was convened to provide an opportunity to build new partnerships among jurisdictions, with an emphasis on the role of subnational jurisdictions in the fight against climate change; to build on the great momentum across the Americas to establish and expand existing carbon pricing networks; and to develop and deliver a common statement on commitments by subnational jurisdictions to reduce GHG emissions. Several speakers addressed the centrality of solar energy to future global energy needs including Mr. Gore. CanSIA's President & CEO John Gorman’s remarks may be listened to online as can John’s remarks from the Climate Change Lab earlier that week. 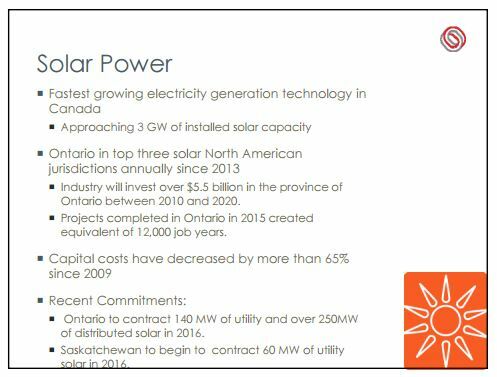 May 12, 2015 - ​John Gorman, CanSIA President & CEO, was a speaker at Insight Information’s 14th Ontario Power Summit session titled “Renewables- Solar & Storage. Has Their Time Finally Come?”. The conference for senior executives in Ontario's energy sector looked at the future of nuclear power, power system challenges and transmission and distribution in light of both technological innovation and the implementation of the direction for the sector proposed by the Premier's Advisory Council. John's presentation may be viewed online. February 6, 2015 - ​John Gorman, CanSIA President and CEO often speaks at conferences and events to spread the word about the exciting opportunities that solar energy provides. In February 2015, he delivered a presentation "Low Capital Costs and Cost of Capital for Utility-Scale Solar: Implications for Developers, Lenders and Political and Regulatory Decision-Makers" at the 6th annual Canadian Power Finance Conference in Toronto. His key message was that solar is becoming the dominant source of new electricity generation globally and Canada will be no exception. April 1, 2014 - ​CanSIA President John Gorman addressed an audience of over 250 senior executives from Ontario’s electricity sector at the Electricity Distributors Association's ENERCOM 2014 with his TED Talk entitled: “The Prosumer Revolution: Becoming Masters of our Electricity Future”. The presentation challenged the status quo of the traditional utility business model and encouraged listeners to imagine what a distributed solar energy future would mean for them and for the business the represent. March 29 - ​In the spirit of ideas worth spreading, TEDx is a program of local, self-organized events that bring people together to share a TED-like experience. At a TEDx event, TEDTalks video and live speakers combine to spark deep discussion and connection in a small group. These local, self-organized events are branded TEDx, where x = independently organized TED event. The TED Conference provides general guidance for the TEDx program, but individual TEDx events are self-organized. The advent of the cellular telephone and the personal computer have dramatically changed the telecommunications and computing sector while putting control in the hands of consumers. Why is it that the electricity sector has not changed since its inception over a century ago? In this TED Talk, John speaks to the advent of the prosumer – consumers that are capable of producing and managing their electricity – empowered through rooftop solar PV and solar enabling technologies.